Product prices and availability are accurate as of 2019-04-18 20:10:51 EDT and are subject to change. Any price and availability information displayed on http://www.amazon.com/ at the time of purchase will apply to the purchase of this product. Tinkii - Adding a little luxury to your world. Treat yourself to some serious self-love with luxurious, salon-quality hair products. Because when you love your hair, everything else naturally falls into place. 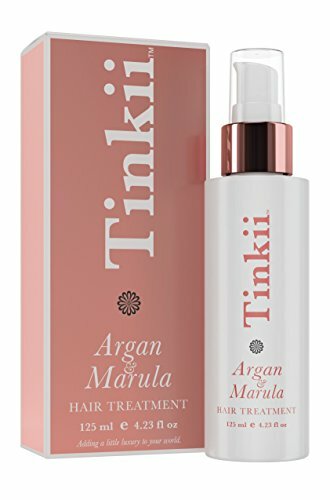 A hair treatment with the incredible double-up combination of Moroccan Argan Oil and Marula Oil. Centuries of African women have revered these oils for their moisturizing and nourishing properties. Now, we've brought them together in a love match destined to make your hair adorable. -Soy Protein to penetrate the hair shaft to repair and strengthen from the inside. - is animal-friendly and free of sulfates, cocamides, parabens, alcohol, linseed oil and artificial colors. If you're not head-over-heels in love with Tinkii Argan and Marula Hair Treatment, simply let us know and we'll refund 100% of your money. WE'RE ALL HEART: Fall in love with your locks all over again with our tender loving hair treatment infused with the natural potency of certified organic Morrocan Argan Oil and virgin, cold-pressed Marula Oil from the wild heart of southern Africa. We created this lightweight, non-greasy, sulfate-free formula for all hair types. WHAT'S LOVE GOT TO DO WITH IT? Everything. When you love your hair, everything else falls into place. Get smitten by our like-no-other combo of ingredients that hydrates, moisturizes and nourishes; soothes away frizz and flyaways; boosts strength, elasticity (and confidence). LOVE AT FIRST SIGHT: Get instant results - brilliant shine, look-at-me manageability, super-fast blow-drying plus sure-thing protection from heat, pool chemicals and the elements. Lose your heart to hair that moves, smoother locks that feel and smell as good as they look. WHAT'S NOT IN IT? Sulfates, cocamides, parabens, alcohol, linseed oil, artificial colors or animal testing. All the stuff that's hard to love. 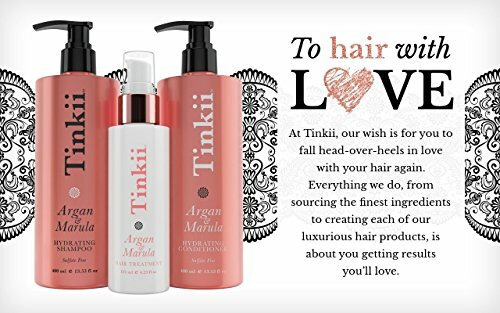 SWEETHEART DEAL: Double-up the hair love - Buy 2 or more products from the Tinkii range and receive 20% Discount off your entire order - Enter code TINKILUV at checkout.